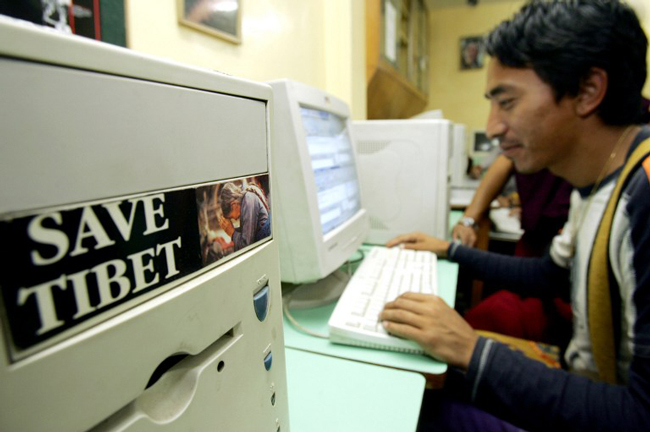 A young Tibetan surfs the internet at a cyber cafe in Dharamsala, India, the seat of the Tibetan government in exile, in a file photo. Chinese authorities have shut down a website founded by a group of young Tibetans that served as a forum for news and literary writings in the native language of the residents of Tibetan-populated regions of western China, a source inside the autonomous region said. Writer Kunchok Tsephel established the website in 2005 with his own money as a joint venture with young poet Kybchen Dedrol in Machu (in Chinese, Maqu) county of Kanlho (Gannan) Tibetan Autonomous Prefecture in Gansu province, according to the Tibetan source and information on the website of the nonprofit, nongovernmental organization Free Tibet. Authorities closed down the website called Choemei (also spelled Chodme), or “Butter Lamp” in Tibetan, on August 18. It was one of the oldest Tibetan websites promoting culture and literature. “The concerned Chinese authorities instructed the owner of the website to re-register with China’s Department of Communications,” the Tibetan source inside the autonomous region said, referring to the body that regulates telecommunications, postal services, broadcasting and print media. The owner of the website apologized to all readers for the abrupt withdrawal of the articles on the website, he said. “Many readers expressed their disappointment at being deprived of their news and access to the website,” he said. Chinese authorities had shut down the website on other occasions as well, according to Free Tibet. In February 2009, they had searched Tsephel’s home and seized his computer, mobile phone and other belongings, and took him into custody. That November, the Intermediate People’s Court in Kanlho sentenced him to 15 years in prison for “divulging state secrets” during a closed-door trial. Authorities previously had detained and tortured Tsephel for two months in 1995 for his alleged involvement in political activities, according to the Free Tibet website. Authorities targeted many other contributors, especially Tibetans, who wrote articles for the website and warned its owners about accepting reports that went against Chinese policy in Tibetan-populated areas, he said. The website carried news and other reports, both written and audio, as well as video stories, music and contemporary writings. Chinese authorities heavily censor the Internet nationwide under a wide variety of laws and administrative regulations, especially in potentially volatile areas. They routinely suppress websites in the Tibetan language as a way to maintain control over the region which has seen sporadic demonstrations challenging Chinese since widespread protests swept the region in 2008. Reported by Lhuboom for RFA’s Tibetan Service. Translated by Karma Dorjee. Written in English by Roseanne Gerin.